We have the ability to spin harden very large sprockets and wheels, and do smaller specialty parts as well. Costs per production run vary, depending on size, volume, and required delivery times. 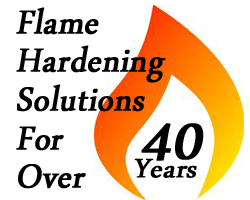 Submit a request for a flame hardening estimate. 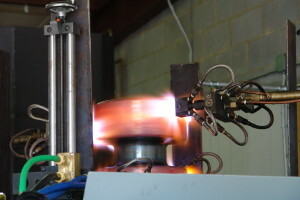 In-house 10,000 lb spinning machine can flame harden parts up to 3000 lbs and 48″ diameter. 4140 Steel dual crane wheels, used in wind turbines, being flame hardened on our in-house spinning machine. Pin heated to 1550° F preparing to drop into quench. Don’t be fooled by the dark rings. The pin is uniformly heated, in spite of what the eye sees. That’s why we use optical pyrometers to provide give us a more accurate reading of temperature than the naked eye can. 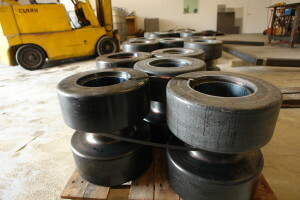 Newly hardened 4140 dual crane wheels ready to ship from our shop. For customers running in-house flame hardening machines in their plants, clean burning torches and flame heads often make the difference between a line that is up and running and one that is marginal or down completely. We specialize in keeping these vital components of your system in top shape, ensuring that you maintain a high level of quality in your production process and lengthening the life of the flame heads as much as possible. 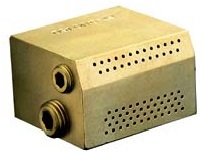 Unless you have maintenance personnel well acquainted with the intricacies of water-cooled flame head design, we recommend that you send flame heads to us regularly to ensure that the ports are conducting gas, oxygen and water cleanly and with the right amount of pressure. We also assess and repair, where possible, problem flame heads that no longer produce even cones or that cannot ignite because of damage from burnbacks. We’ve seen it all in our shop – and we’ll let you know if repair or replacement makes the most sense. Since many plants can’t cope with downtime for maintenance, we recommend all customers keep spare flame heads and torch fronts in stock. If you need to replenish your stock, submit a request for replacement parts. 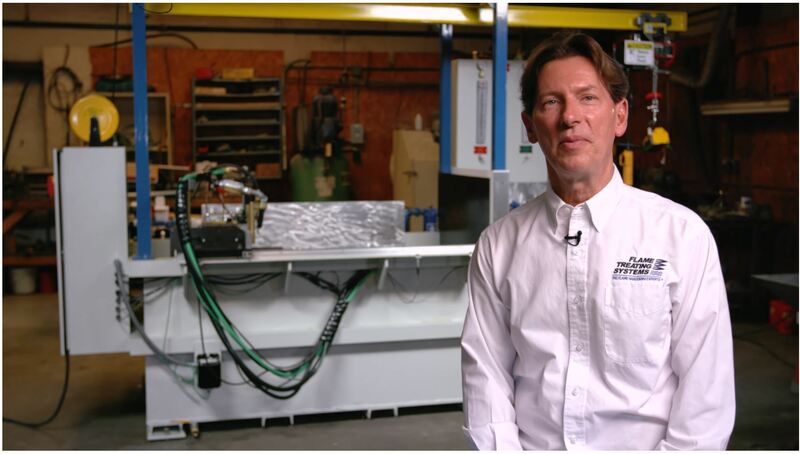 Tempering stabilizes the structure of steel that has had localized hardening of surfaces. It heats the part to a temperature lower than that needed to harden the surface and air-cools it in still air. 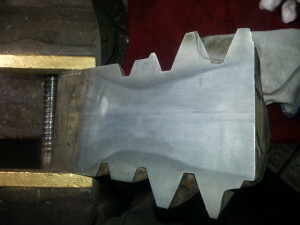 The result is a finished piece that is hardened within spec and tempered to reduce brittleness. 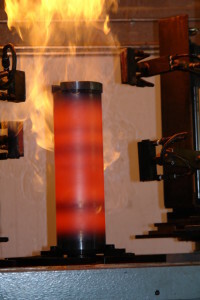 Flame Treating Systems, Inc. can temper parts up to 36″ tall and 48″ in diameter, weighing up to 1900 pounds. 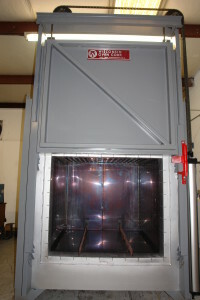 Our tempering oven can heat as high as 1200 degrees Fahrenheit. 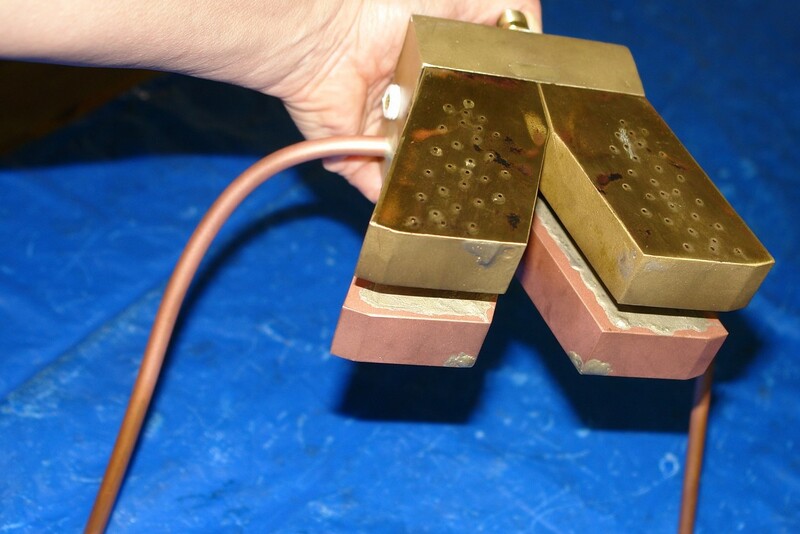 We often include tempering with our flame hardening services – you’ll see it is part of our quote. If you are looking for additional stress relief of weldments and castings, our tempering services may also be the answer for you. Tempering will stabilize the steel or cast iron so that machining can be done with less opportunity for breakage or cracks. 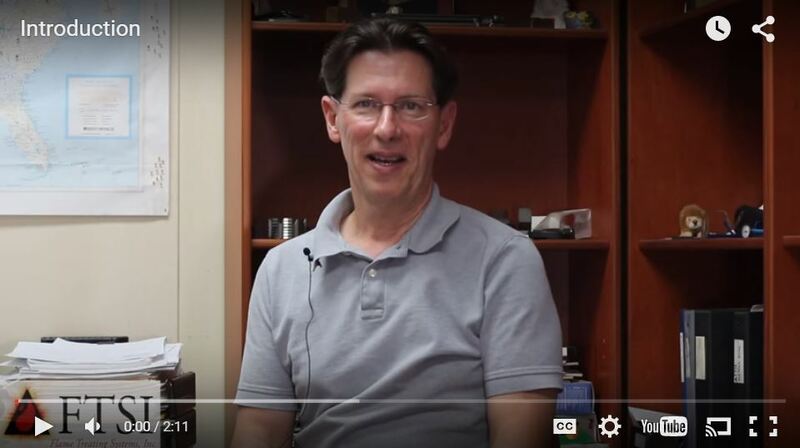 Call us today to see if we can help you with your heat treating needs: 919-956-5208. Or email mark@flametreatingsystems.com. Has your existing flame hardening machine gone down and brought your production line to a standstill? If your maintenance experts can’t solve the problem, call us. We can arrange to visit your plant to diagnose existing problems and recommend a solution. We also frequently help folks determine whether existing equipment is worth repair or needs replacing. 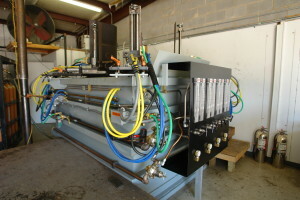 Email mark@flametreatingsystems.com or call 919-956-5208. Our design team will work with you on your prototype part to create a production-level specification and proof-of-concept hardness test. 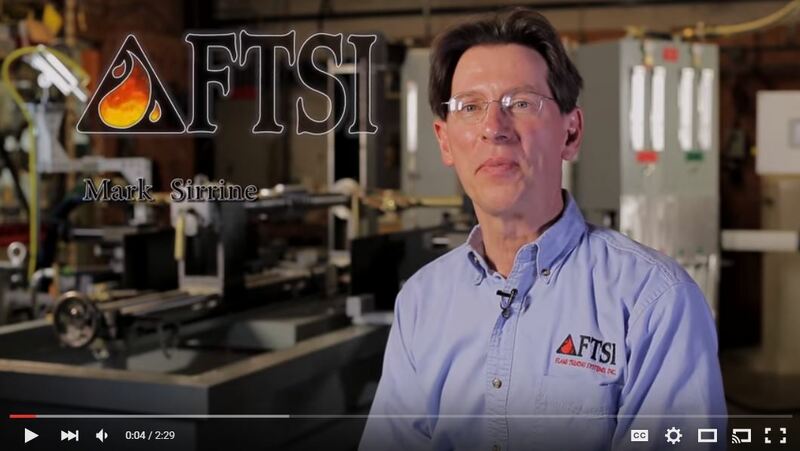 We will give you a hard estimate for the amount of work it will take to test, establish pattern parameters, and retest, and then to document the process so that it can be duplicated in production. Email mark@flametreatingsystems.com or call 919-956-5208. Cut open worm shaft showing hardness pattern of Rockwell 55-57.